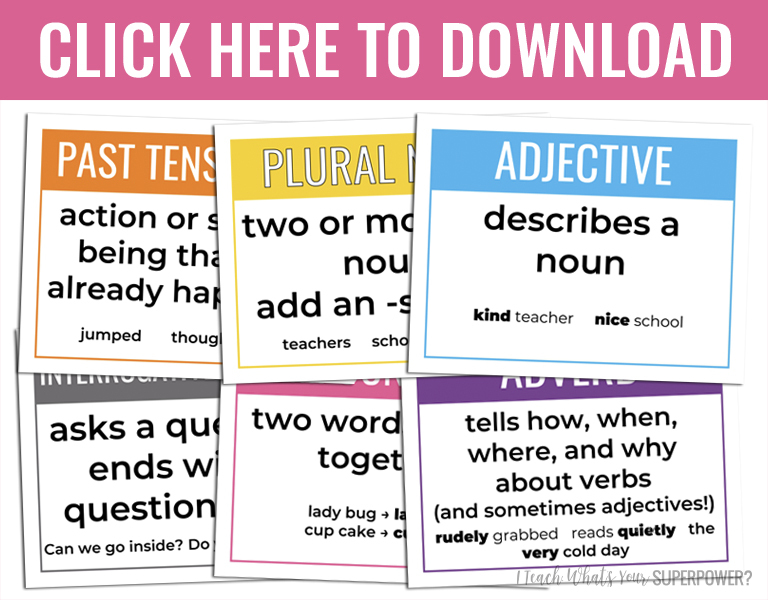 Making Vocabulary Stick with Mentor Sentences | I Teach. What's Your Superpower? Hey there! I shared in a previous post, Meaningful Instruction with Mentor Sentences, why I quit doing DOL warmups, started doing Mentor Sentences, went back to DOL, and then went back to using Mentor Sentences to teach grammar. Whew. Basically, I was willing to give Mentor Sentences ago after my previous district encouraged it. And I do mean encourage-zero training, zero resources. As expected, that went really well. 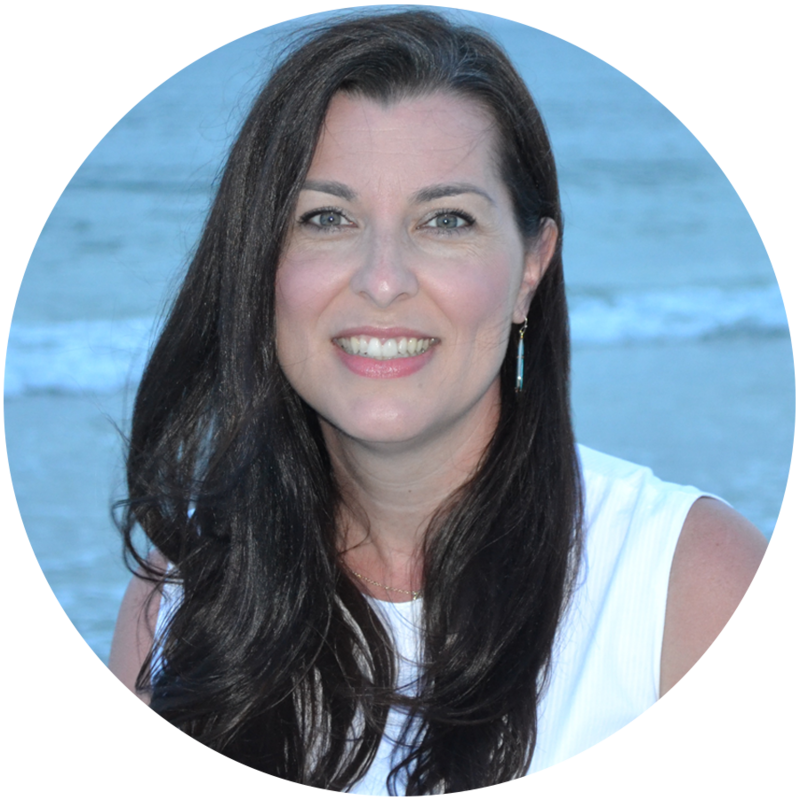 When Ideas by Jivey started offering dummy proof resources (my words, not hers!) for mentor sentences, I was willing to give it a try again. Ideally, I would be pulling sentences myself, but parts of speech are HARD. I don't need that drama and angst in my life for a ten minute lesson. I'll save that time and energy for something else. She also offers tons of support in this Facebook group. And you know what? Mentor Sentences are awesome. 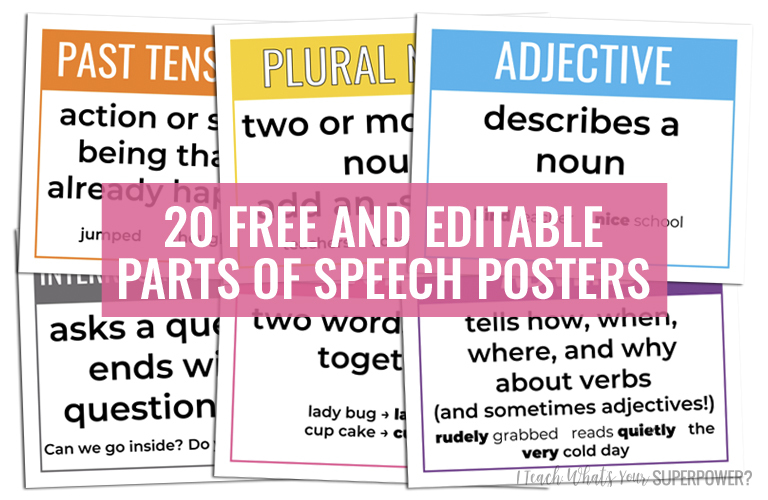 I noticed that I was introducing and referring to the vocabulary of parts of speech frequently and getting a, "Now what did she say that thing was called?" look from many of my students. 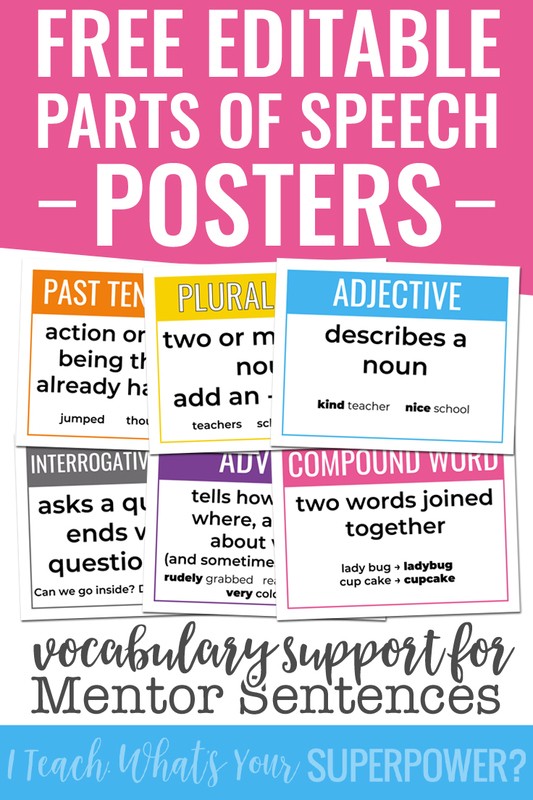 I made these posters for students, so they could refer to them and use the vocabulary. I put them up as we learned about a new part of speech. It was SHOCKING how quickly most of them were up in my second grade classroom. Using mentor sentences allows us to get going quickly with parts of speech instead of waiting to talk about adjectives for two week in January when it shows up on the pacing guide. You can get the posters here or by clicking on the image above. The file is in Google Drive, so edit away! It is view only, so you'll need to go to File-->Make a Copy to create a document you can edit. Change names, definitions to match your grade level/standard, have at it. Poster pro tip-print four posters on a page, laminate, put them on a ring, and leave out for students at their tables. THEY ACTUALLY USE POSTERS THIS WAY. It's a miracle. I love the idea of color coding grammar! I'm off to read more about that!